We have had two unexpected visitors in the hangar lately, and as odd as this sounds, I feel kind of lucky about it. Agkistrodon Piscivorus is the Latin name for Water Moccasin. There are only four poisonous snakes in America, and this is one of them (Florida is the only state that has plenty of all four). In the past week we have had two in the hangar, an unpleasant experience to say the least. 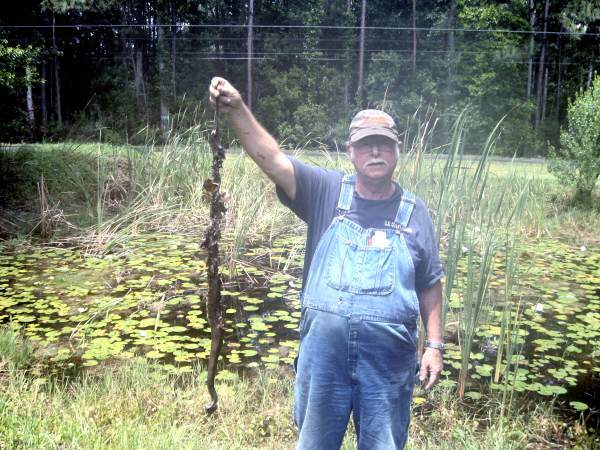 Above, Vern stands by our pond with a 42″ moccasin that I caught with a 20 gauge (2-3/4″ shell with #6 shot) last night at dark. This is big for a moccasin. World record is only 74″, and in 25 years in Florida, the biggest I have seen is about 50″. This size is plenty dangerous. Not often fatal to humans, they do cause lifelong damage by destroying pounds of tissue permanently at the bite location. They frequently kill medium and large dogs. I was closing the hangar door and found him 4 feet away, but this is not close at all. Last week, Vern stepped on a 36″ moccasin in the doorway to the side of our hangar. It turned and bit right through his boot, injected his venom, but by a miracle, it soaked Vern’s sock, but failed to get his flesh! Vern is an experienced woodsman and a lifelong hunter, but even he needed to sit down for an hour and try to collect himself. For the past week, both of us have jumped out of our skin several times when an air hose or extension cord has brushed an ankle or foot. I was thankful I did not step on mine, and Vern felt a little charmed that he missed being bitten by 1/32nd of an inch. Environmentalists can rest assured that moccasins are not endangered, there are enough of them in our neighborhood that they are now a trip and fall hazard. Right after I took the photo, Vern tossed him in the pond where he was promptly “re-cycled” by the very large alligator snapping turtle that lives there. He ate the last one also. 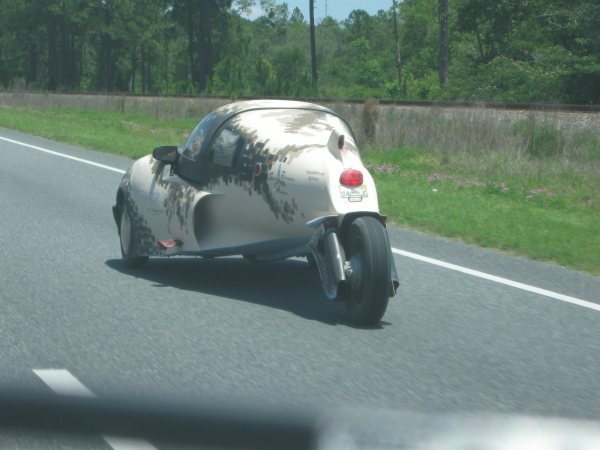 For builders who had a chance to see Vern’s aero-trike (1/2 Lancair 320, 1/2 Geo Metro) at Corvair College and Sun n Fun, here is a shot of it driving down Route 17 at 65 mph. I drove it 25 miles the other day, and it handles much better than you might guess. Vern was plagued with computer issues on the Geo’s original EFI set-up. I called Jeron Smith, noted Geo expert at Raven Redrives, and he provided us with a distributor and carb set-up to ditch all the computer and EFI stuff. Worked like a charm. Simplified, the vehicle runs flawlessly. So much for complexity. It gets 50 mpg in mixed driving. Vern even has the A/C working now. He has slightly under $1,000 in the project, total.